WINNER! Best Time Management Game of 2008! 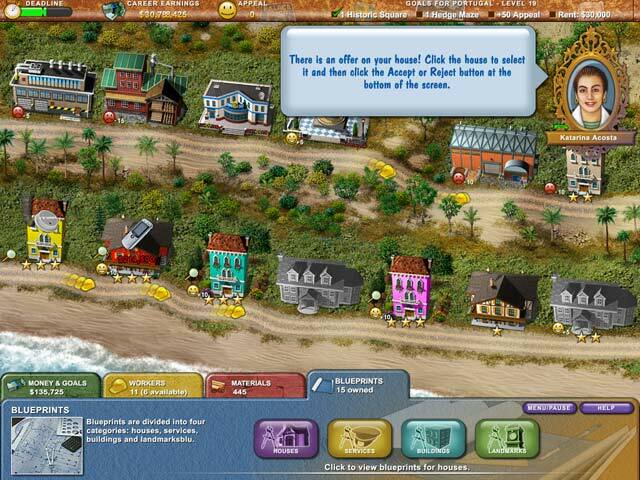 Travel all over Europe restoring rundown homes to their former grandeur in this expansive Time Management game! Build your curb appeal with fresh coats of paint and enticing landscaping. Stay on top of the needs of the neighborhood, averting crises and calming noisy neighbors. With tons of developmental decisions and eye-catching upgrades, today`s market is ripe for Build-a-lot 3: Passport to Europe! 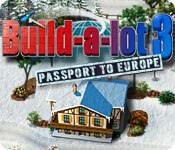 Build-a-lot 3: Passport to Europe is rated 4.4 out of 5 by 10. Rated 5 out of 5 by paramiti from MY FAVORITE BUILD A LOT GAME Hands Down My All Time Favorite Build A Lot Game!! Love This Game Played So Many Times I have lost count Never Tire of IT!! Rated 5 out of 5 by beltie from Love It!! I just love this entire series. I'm sooo glad they keep adding to it. Each new addition has the same format, with new additions, building styles and themes. Pet peeve: It really bother me when a developer changes the entire format mid-stream and one ends up hating what was a great game. Fortunately, the developers of this series doesn't do that. The entire series has wonderful graphics, challenging levels and great replay . . . I even like the sound effects and I usually mute those :) This one is no exception If they keep making these, I'll keep playing them! Great job guys! Thank you! Rated 5 out of 5 by Tiger2010 from Passport to Fun!! This is another fantastic addition to the Build-a-lot series. 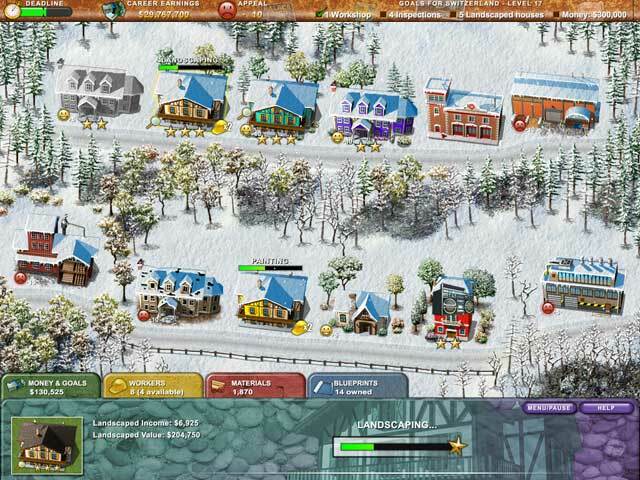 This time you are visiting European countries with a view to helping out the citizens of various fictional cities. As ever, these games start tame, as has been mentioned, but become progressively harder from level 31 onwards. Some are so challenging you will probably have to play them several times, planning and strategising even before you begin a level. Can you complete all requirements on Expert? You can also play the casual un-timed mode. As ever, in the later levels more objectives will be thrown at you almost at the last minute. It's tough indeed, but a long fun game well worth the price. The graphics are excellent and the developers have tried to match music befitting to each country (not sure they always got this right), meaning you are not listening to the same melody through all 45 levels. Great game for a day when you can lock the door and forget about doing anything else until you're through. Rated 5 out of 5 by catbag8717 from Best Game of the Series!! This game is absolutely brilliant, even better than Build a lot 2, which, up to now, was my favourite Build a lot game. Good Parts: Finally, finally, the developers have listened! They've improved the game's graphics dramatically and it has paid off! It really felt like I was playing a modern-day game. Once again, this game has a storyline. You travel all over europe building and restoring homes. One of the new features of this game was Restoring run-down houses which had a negative appeal on the neighbourhood. This really added fun and excitement to the game. OK Parts: Fire department. This was another new feature in the game, which I thought was fun, untill I found out it cost $5,000 to call them! Bad Parts: In the first level of Portugal, I was completely ovewhelmed. The impossible goals, added by building a workshop, which added negative appeal to the neighbourhood, and topped off by never having enough money or materials. Smoke damage and repairs would always appear in the wrong places and I was forced to restart this level quite a few times. Apart from the one flaw, you'll never find anything bad about this game. It's great for lovers of the series, or new players. Rated 5 out of 5 by pclove2play from To Much Fun Too Much Fun. It starts out very easy, you think it's a piece of cake and as the game goes on the difficulty level gets harder. Once you start playing it's hard to stop. If you love TM games the Build-A-Lot's are one of the best collections you can own and I can't wait for the next one to come out. I own them all and I recommend you give it a try. Rated 4 out of 5 by jms4jms from Good Game I bought this game a month ago and by suprise I still havent beat it yet. Its harder then sum might think. Rated 3 out of 5 by tristan13669 from The game is... I THINK ITS A OK GAME REALLY!! Rated 2 out of 5 by Bumbles2 from I tried ! With all the great reviews I've read about this series I thot I'd just download the free preview and see for myself. Honestly folks....I tried...believe me I tried to like this type of game...it just didn't do anything for me. Not sure if I was playing it right or what but I just could not get into this real-estate game. I'm sure its a lot of fun to some...it just didn't appeal to me ! 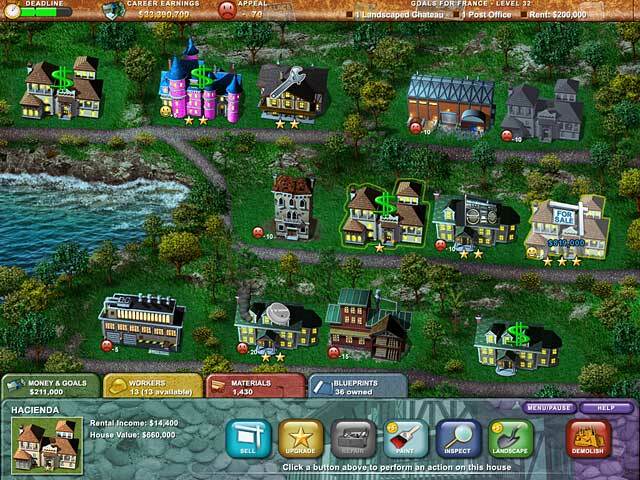 Travel all over Europe restoring rundown homes to their former grandeur in this expansive Time Management game!